IRVINE, CA--(Marketwire - Feb 21, 2013) - Lantronix, Inc. (NASDAQ: LTRX), a leading global provider of smart M2M (machine-to-machine) connectivity solutions, today announced the launch of its new xPico™ Wi-Fi® module, a compact, embedded wireless device server designed for easy and fast serial-to-Wi-Fi connectivity. Lantronix will be showcasing a live demo of the xPico Wi-Fi device during Embedded World 2013 at the Nuremberg Exhibition Centre, Hall 1 - Booth I-309, from February 26 - 28, 2013. With the launch of the xPico Wi-Fi embedded module, Lantronix brings its industry-leading connectivity expertise into one of the world's smallest and easiest to use serial-to-Wi-Fi device server. The xPico Wi-Fi device, which boasts a tiny footprint of 24mm x 16.5mm, is a pin and form factor compatible member of the xPico product family. "The new Wi-Fi addition to the xPico product line makes for very easy migration from wired to wireless applications," said Roberto Martinelli, director of research and development at DeltaOHM s.r.l. / Italy. "In addition to the Wi-Fi capability -- the xPico device's small footprint, full IP Stack and advanced security makes for an extremely cost-effective and robust solution that will speed our time to market -- truly a competitive advantage for our organization." Easy to deploy and use: No need for software development or to write a single line of code. Innovative form factor: Compact footprint: 24mm x 16.5mm. Robust: Complete "device server application" with full IP stack and web browser. Industrial-ready: Serial Data Rate of up to 921 kbps; Operating environment at extended temperatures: -40° to +85° C.
Value: Low-power, small form factor provides rapid integration into size- and power-sensitive applications, including battery-powered devices. Guaranteed: Industry-leading 5-Year limited warranty. "The launch of xPico Wi-Fi once again highlights our focus on delivering innovative and easy-to-use solutions for machine-to-machine connectivity," said Mak Manesh, vice president of product management for Lantronix. "The unique form factor -- half the size of a standard SD flash card, new low power Wi-Fi functionality, and the ability to implement solutions without writing a single line of code all make the robust xPico Wi-Fi a clear choice for migrating to wireless connectivity." xPico Wi-Fi, which is sampling now and begins volume shipping in the early half of calendar 2013, is available for pre-order now by calling (800) 422-7055, and at the time of shipping will be available for purchase globally through Lantronix.com, as well as through the company's distribution channels and partners on a worldwide basis. Volume pricing begins in the mid $20 range. 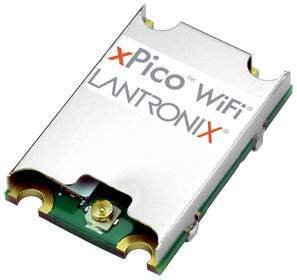 For more information or general questions about xPico Wi-Fi, high volume pricing, and availability, please contact us at sales@lantronix.com. Lantronix, Inc. (NASDAQ: LTRX) is a global leader of secure M2M (machine-to-machine) communication technologies that simplify access and communication with and between virtually any electronic device. Our smart connectivity solutions enable sharing data between devices and applications to empower businesses to make better decisions based on real-time information, and gain a competitive advantage by generating new revenue streams, improving productivity and increasing efficiency and profitability. Easy to integrate and deploy, Lantronix products remotely and securely connect electronic equipment via networks and the Internet. Founded in 1989, Lantronix serves some of the largest medical, security, industrial and building automation, transportation, retail/POS, financial, government, consumer electronics/appliances, IT/data center and pro-AV/signage entities in the world. The company's headquarters are located in Irvine, Calif.
For more information, visit www.lantronix.com. The Lantronix blog, http://www.lantronix.com/blog, features industry discussion and updates. Follow Lantronix on Twitter at http://www.twitter.com/Lantronix. © 2013 Lantronix, Inc. Lantronix, EDS-MD, PremierWave, xPico, xPort and xPrintServer are trademarks of Lantronix, Inc. The term Wi-Fi® is a registered trademark of the Wi-Fi Alliance®. All other trademarks and trade names are the property of their respective holders. Specifications subject to change without notice. All rights reserved.